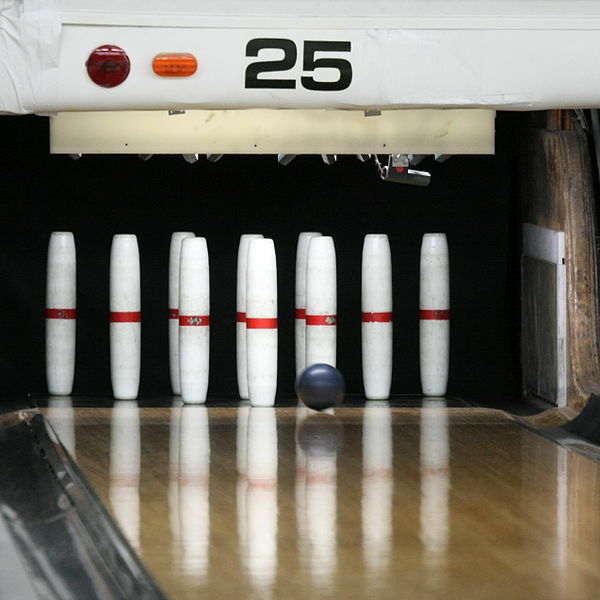 The game is played on the same lanes as regular "tenpin" bowling, but fundamental differences separate the two variations. First of all, you get three balls per frame, rather than two. Second, the balls fit in the palm of your hand and only weigh up to two pounds, seven ounces. The pins are almost 16 inches tall and are shaped like cylinders. Third, and most interesting, pins knocked down that remain on the lane are in play as "wood". This often makes for easier - and sometimes more frustrating - shots. Wikipedia has information. There's even an International Candlepin Bowling Association (encompassing New Brunswick, Nova Scotia, Maine, Massachusetts, and New Hampshire). It's a lot tougher to play than ten-pin. It felt a little little like the baseball vs. milk bottle game at the CNE, in that the pins don't bounce around the way you wish they would. The only way I could score consistently was to whip the ball down the gutter and let it ricochet back into the pins, taking out perhaps one pin -- and now that I read more about the rules, I find that's not even allowed. Outscored by a five-year-old. Kids these days. Sounds neat, maybe we can give it a try when we visit you guys. Which type of bowling is your favourite? 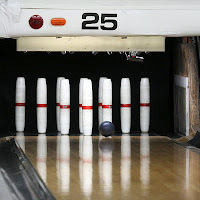 I like ten-pin with the big ball -- if you hurl it hard enough, it goes somewhat straight and will usually knock down several pins. Amanda concurs.